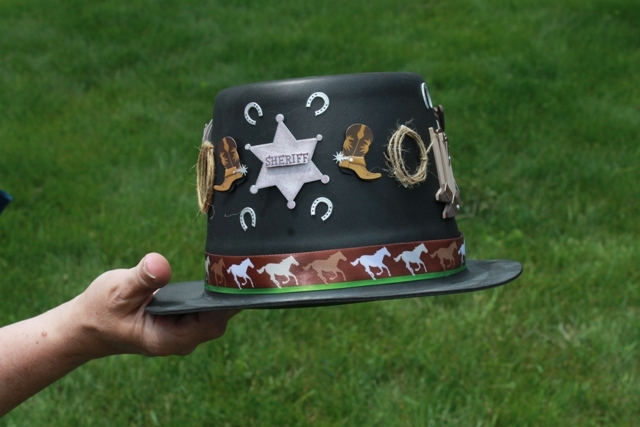 These (Little) Boots are made for Stalking: Diary of Obsessive Svengoolie Fan! 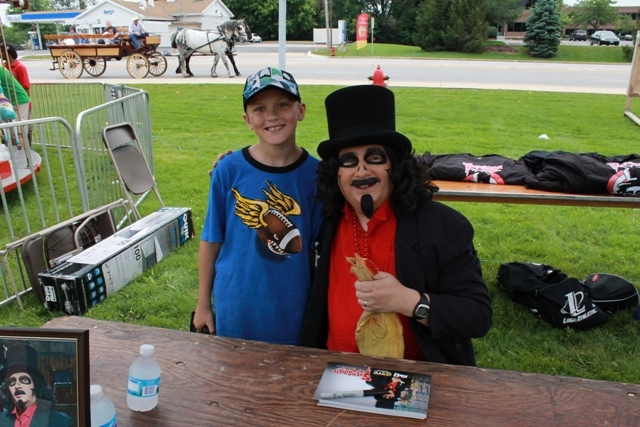 It was a muggy day here in Chicago when national horror host, Svengoolie, made his annual appearance at The Little Boots Rodeo in Elk Grove Village. Last year was my first visit to this event and, in regards to weather, was far worse with direct sunshine and even higher temps. At least today there was a breeze – though it’s worth noting that even if it had been hailing fireballs I’d probably still of shown up. Recently, Ms Cortese began an internship at Sven’s TV station and today would mark the first Svengoolie appearance where she’d be attending “officially” and helping him out rather just paying a visit. 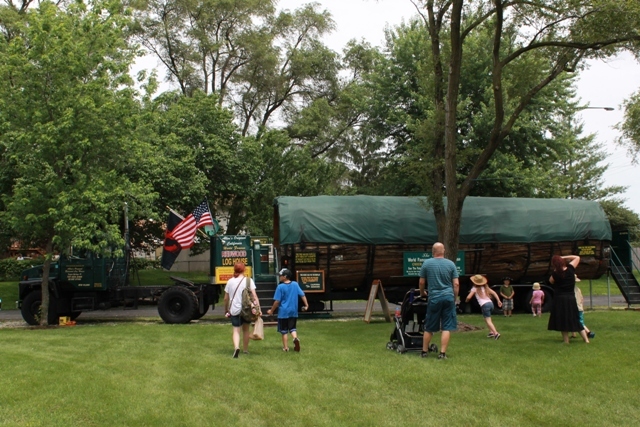 My kids and I arrived just as the festivities began with many booths still in the process of setting up. I no sooner walked in when I saw one that specialized in dinosaurs. Anybody who knows me, also knows I’m a HUGE fan of dinos – a childhood love I never outgrew. 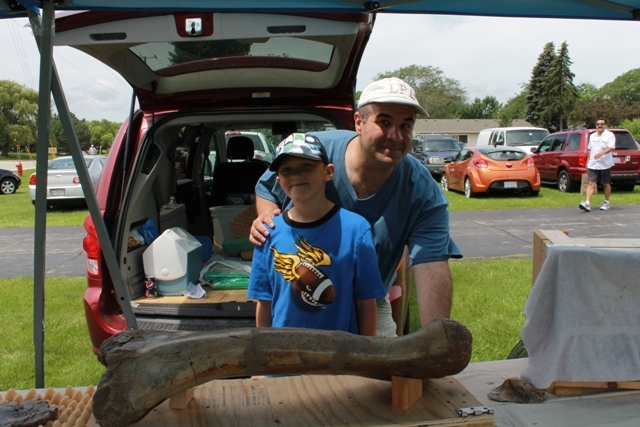 The tent was helmed by a paleontologist who showed off some of his own discoveries while excavating in Montana and allowed me to touch and pose with his triceratops bone – not a cast but the real deal! 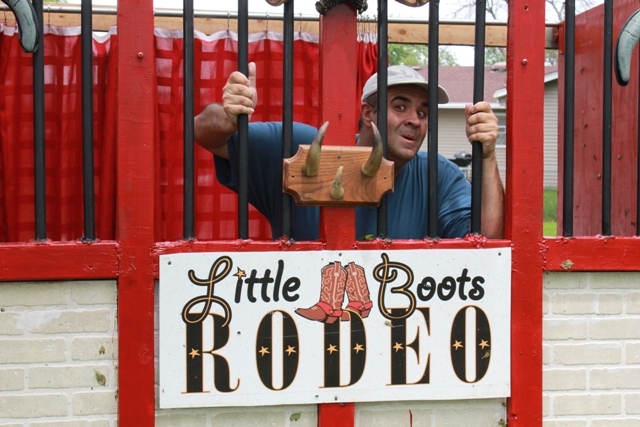 The man’s name was David Howe who heads up a special educational program for kids called T-Rexplorers! After that we checked out some of the other features Little Boots had to offer including an air-conditioned “tree house”…and I’m talking a whole tree that was turned into a house that you could walk through! It was soon after reaching this vicinity that I spotted two of my fellow “Sven Goolies,” Ron and Angela Urban. They’d spent the day with me at Little Boots last year and, while pouring cold water down our throats and feeling sorry for our favorite celebrity having to wear a blazer, discussed the possibility of him donning a cooler, Western ensemble specifically for the Little Boots Rodeo. Ever since I’d seen Sven dressed as Sventa Claus during a holiday appearance, as well as a green St. Patrick’s Day outfit from his “Airin of the Green Hornet” special, I’ve had visions of him wearing different Sven costumes to match his various appearances. Sort of like how Linda Carter’s Wonder Woman had a special swimsuit and motorcycle outfit in her ’70s TV show to match whatever situation she was in…or maybe Iron Man and his various suits of armor would be a more masculine analogy? The Urbans and I were irked; especially since his job last year was to sign for two hours which, so far as we could tell, was exactly what he was doing this time around. 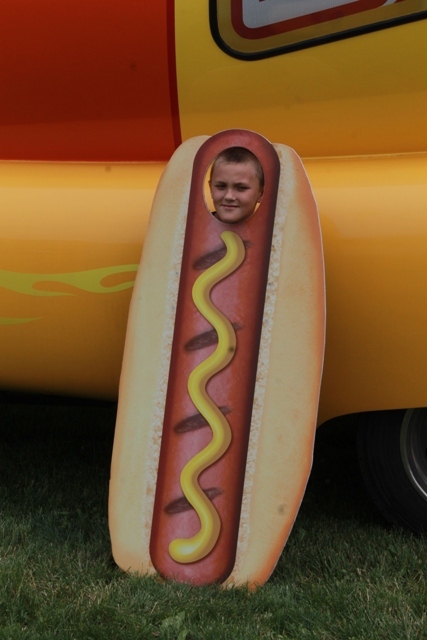 He was appearing one day instead of two but that’s how most of his appearances are. All that other stuff, like being sawed in half, was situational and I don’t believe intended to be done every single year. 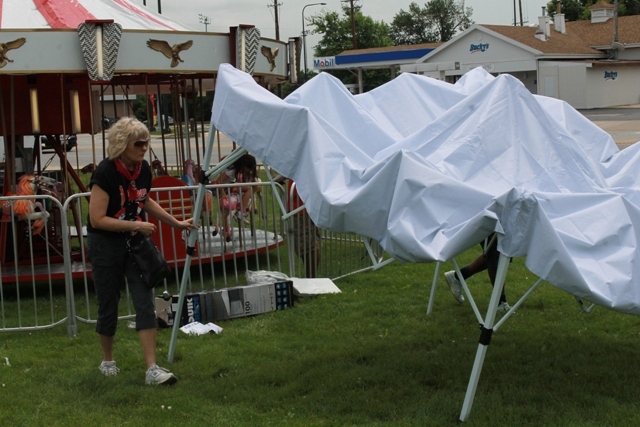 Setting up the Svengoolie tent! First to arrive on the scene was Jamie Lee, whom we congratulated for her new role at the station. It was sad not seeing her in her signature Svengoolie garb but such is life. Of course that didn’t stop me from teasing her as I kept asking if Rich Koz was a total Diva who belittles staff members for bringing him Hinkley & Schmidt water when he’ll only drink the pure Artesian variety. 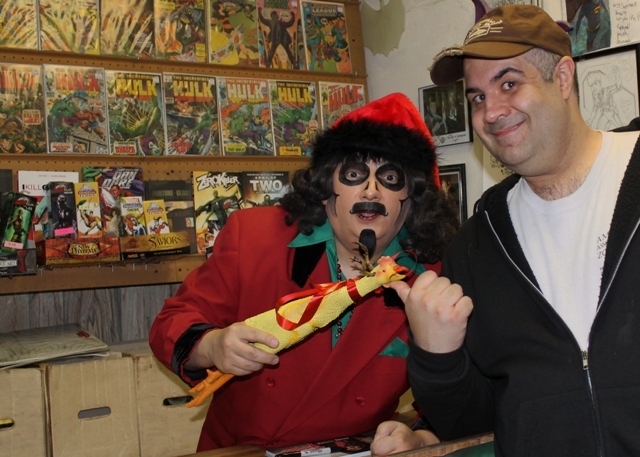 We both laughed since, in terms of ego, we both knew that Rich Koz/Svengoolie couldn’t be more opposite. 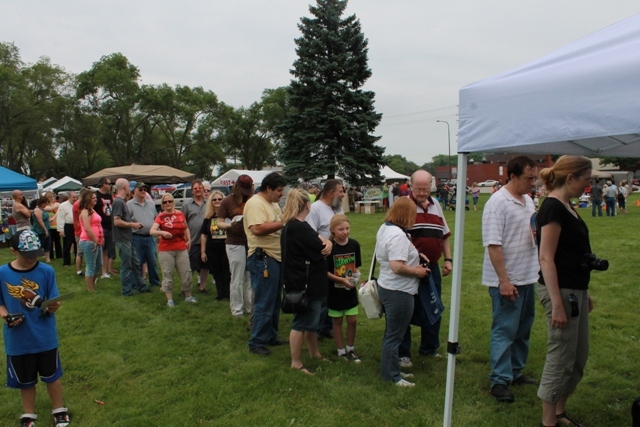 My nine year old son, Luke, was part of the line and determined to have his Godzilla toy signed. He’d been in Colorado last year when Sven appeared at G-FEST (Godzilla Festival) and wanted to make up for his lost opportunity. As it turned out, both the paleontologist as well as a couple of other people at the event were also big G fans and approached Luke to say so…one even wearing a Godzilla T-Shirt. I’d always assumed my kids just put up with my Sven-anigans and me dragging them to many of these events but, apparently, Luke genuinely inherited my love of the host. 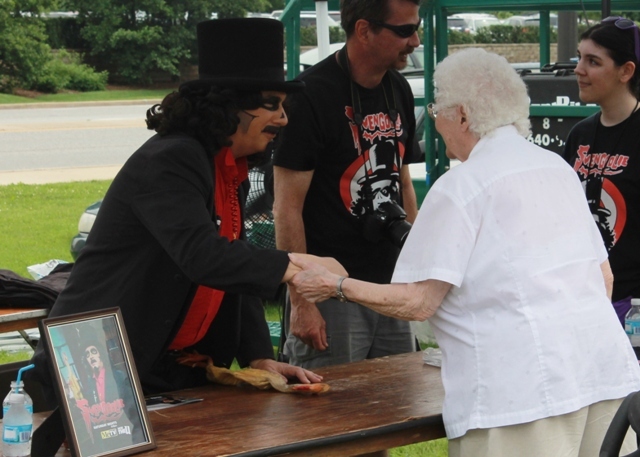 He’s been watching him with me faithfully, spent the whole week agonizing on what he’d have Svengoolie sign for him, and was concerned on the ride over saying, “I don’t think he knows who I am anymore,” after not seeing him for over a year. “Well maybe if you talk to him and tell him how much you like his show, he will,” I said. When it was Luke’s turn, he told Sven how much he enjoyed the previous week’s show, an ALL-NEW presentation of King Kong Escapes. Of course with all the background noise he had to repeat himself a few times but finally got the message out. 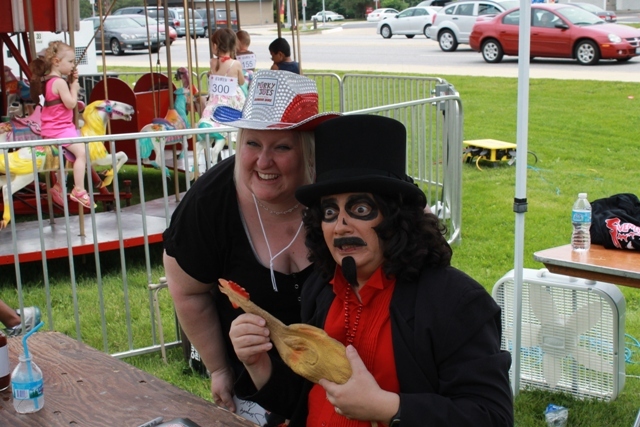 I’m not sure how but it was at that point that I recognized the woman from a 2011 Svengoolie appearance he’d done up in Long Grove (story HERE). Considering how many Sven signings I’ve done and how many of his fans I’ve spoken with, I must say I was impressed with myself for pinpointing the exact locale. I had included a shot of her with her two daughters in that piece but, this time, she’d brought only one. She must have enjoyed my coverage as she was eager to be included in this story too and, by the time the signing over, would go back in line to meet Sven a few times to ensure I got a good picture. Kaci & Ann Marie Westfall…mission accomplished! Finally I made it over to the Yingst’s whom, like C2E2 last month, had an important role to play. This time it was Bill’s turn since I needed a Wolf Man to pull things off. 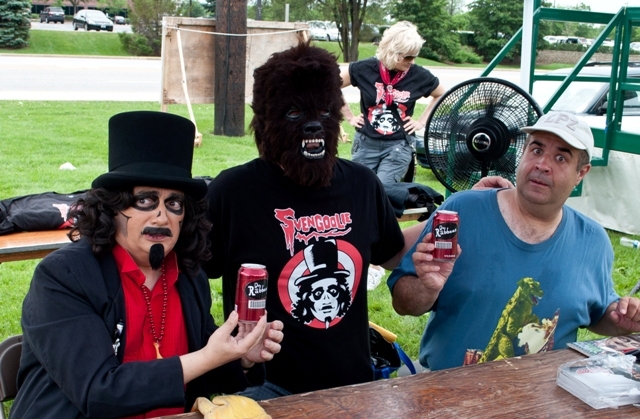 During another Angela Urban brainstorming session, I told her I wanted a mock soda can for Dr. Rabbees – an old Son of Svengoolie skit that was a favorite of mine both then and now. At the time it was in preparation for a possible meeting with American Werewolf in London actor, David Naughton, who’s musical Dr. Pepper commercial was being parodied. I’d met Naughton before and had him sign something for Sven (covered HERE) but wanted to take things a step further. That second encounter didn’t happen but, when it does, I’m armed and ready for it. 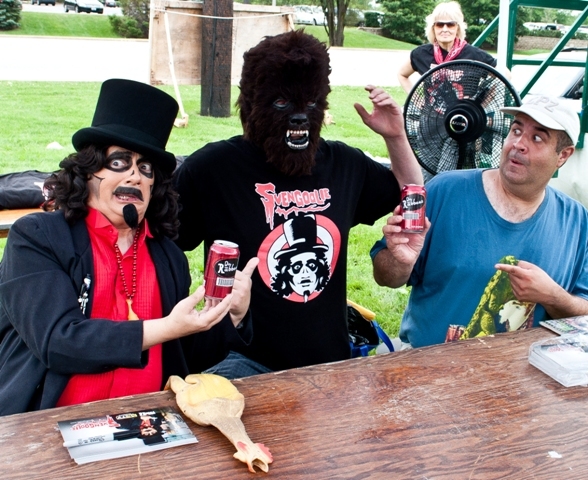 The project would involve Svengoolie fans, David and Rose Westfall (as far as I know, no relation to Ann Marie and Kaci) creating the label based on a TV image, Angela adhering them to Dr. Pepper cans, and me setting up the shot. I had a great wolf man mask created by Ohio horror host, Dr. David Lady, and purchased for me by Terror Dave Albaugh back in 2011. I just needed someone to wear it which is where Bill came in.Well, if I’m going to end up getting charged for stalking, I may as well use what little freedom I have left to inspire the slightly-less-obsessive troops! My favorite shot thanks to the hilarious Svengoolie! I stayed the whole signing and enjoyed watching Jim’s banter with fans again. 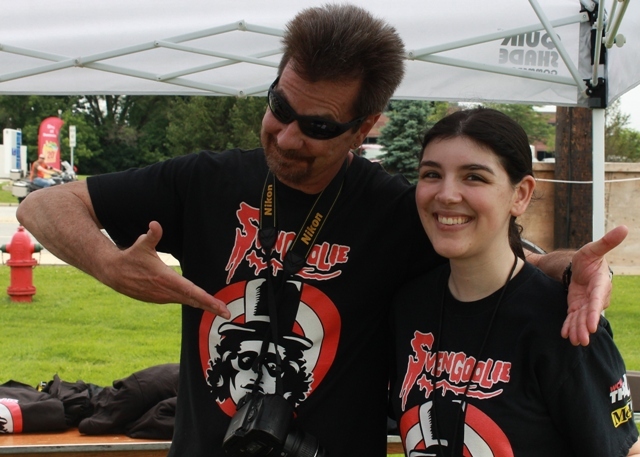 At one point a full-figured gal approached Jim holding a $20 bill to purchase a Svengoolie T-Shirt (which you can order HERE). Another woman brought Sven some home-made BBQ sauce created by her husband. 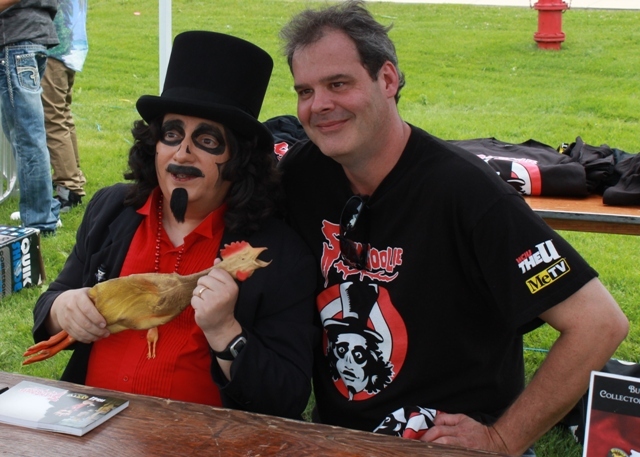 This reminded me of yet another Svengoolie signing from last year at The Rockin’ Rib Fest (story HERE)! 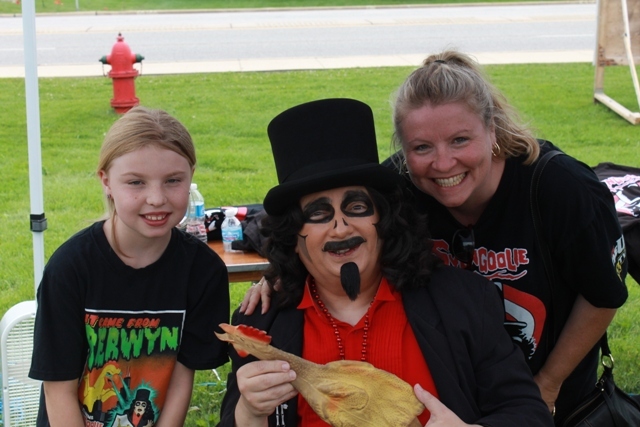 Angela presented Svengoolie with his new hat, which just fit considering the extra head space his wig creates! Towards the end of the signing a warm moment came courtesy of an older woman who waited in line patiently to see him. She didn’t ask for an autograph nor pose for a picture, merely wanted to tell him that she enjoyed watching his show and was glad that he was doing okay. The line stayed steady the entire two hours and, though not nearly as intense as C2E2, didn’t afford much time for me to interact with him. 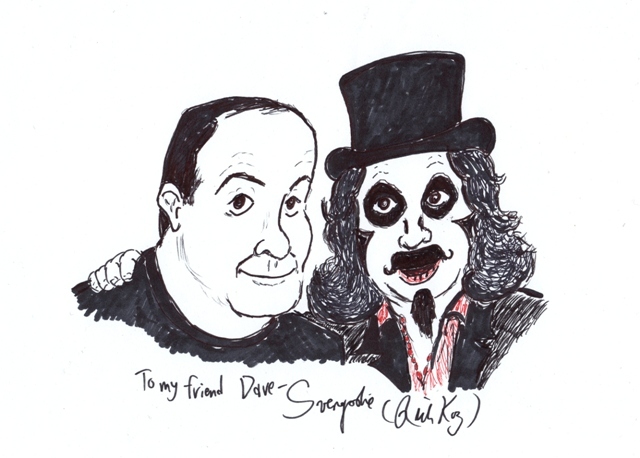 Svengoolie, however, did honor me by giving me a cartoon caricature of he and I that I immediately had framed. A welcome and prized addition to my Sventerior Decorating! After the signing ended, we said goodby to Sven and the gang and walked around a bit more. 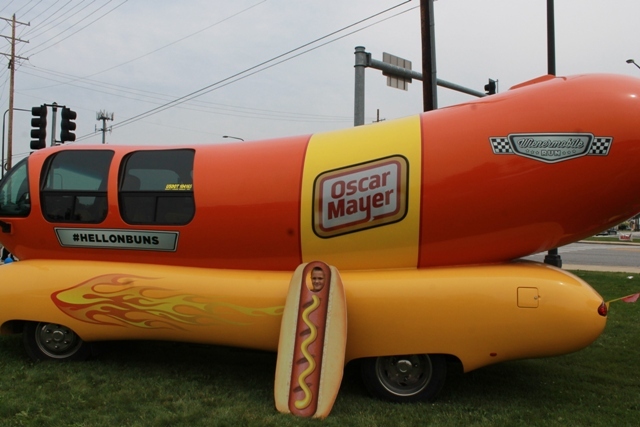 We saw some other interesting things like a people-friendly alligator named “Bubba: The Legend Continues” (I actually once snuggled with the first Bubba, but that’s another story) and the Oscar Meyer Weiner Wagon (I’m sure if Jim were nearby, he’d have had something funny to say about it). 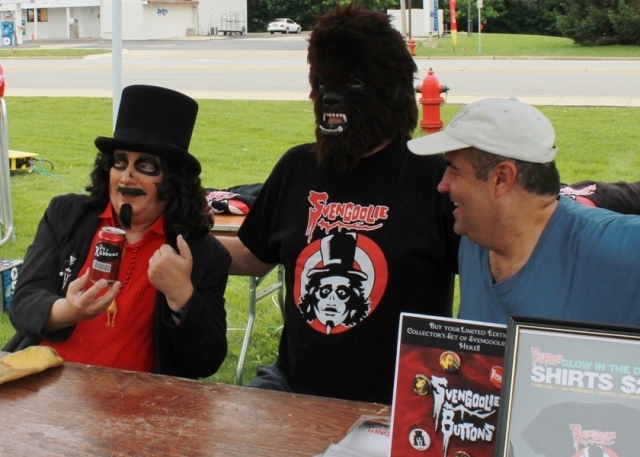 Maybe it’s a bit obsessive going to as many Svengoolie appearances as I do but each one definitely has its own flavor, even when its a spot he does every year. And if you’re gonna stalk someone, isn’t better that they be a nice guy like Svengoolie? This entry was posted in Horror Hosts, Stalking Svengoolie! 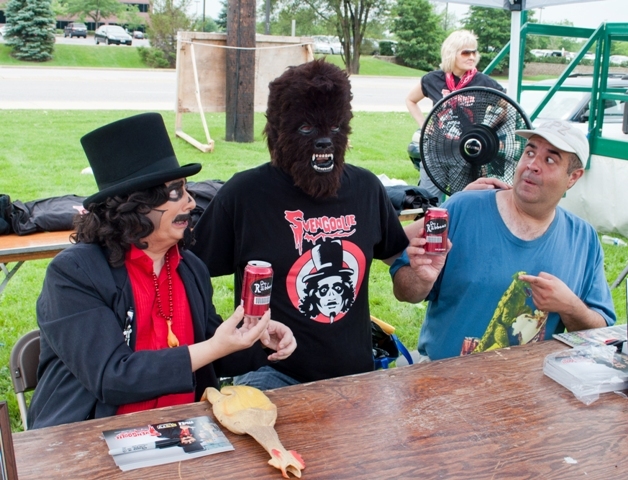 and tagged AN AMERICAN WEREWOLF IN LONDON, DAVID NAUGHTON, Dr. Pepper, Svengoolie. Bookmark the permalink. ← Midnight Syndicate’s NEW “Monsters of Legend” CD to be unleashed! Dave, back to the beginning of the article. Grateful Dead fans are DeadHeads. Jimmy Buffet fans are ParrotHeads. SvenHeads would be too easy. RealDeadHeads ? KerwynHeads ? TrulyGoolies ? Just a few musings. Take care. Sounds good, Greg, because right now I seem to be undefinable! Personally, I like TrulyGoolies !